Night hung heavy over Nexus, weighing the city down like a sodden cloak; the thick, velvety folds clung to every crevice, eased into every gap, and filled the city with rich darkness. It had a presence, a power, all its own, and for most that was both a comfort and a concern. One such figure defied the night’s power with every step. Every movement, every gesture pushed back against the night’s weight, slicing through the darkness as a part of it, spurning its shroud only so that she might wrap those shadows more firmly about herself. As she moved, the long tails of her vivid red jacket streamed behind her, her long red tresses flowing out to match. She was like a flame in the night herself, dancing across the rooftops. Flitting from shadow to shadow and corner to corner, her lithe form coiled and uncoiled in a ballet of motion that carried her across the city. Novia Claro did not hide from the night, nor did she fear it. Novia loved the night, loved feeling the dark, cool air rushing past her, lifting her as she leapt but having to surrender her again each time as her feet once more touched down on tile, slat, or beam. She could roam the city like this for hours. From up here, Nexus was clean and beautiful, all its grime hidden, all of its rough edges smoothed, its tired grandeur given a new gloss beneath moonlight and starscape. The moon illuminated the Nexus District’s ancient towers and the spindly sky bridges connecting them. It shed its soft glow on the mansions of Bastion atop their hills, and the sprawling farmlands down below the city. From this height, the Night Market’s many lanterns were a bright beacon in an otherwise darkened district. The rivers that surrounded the city glistened, beautiful ribbons of black and silver entwined as far as the eye could see. Nexus hung between them like a jewel, a dark pearl with a gloss all its own. Right now, she was most focused on one sliver of that pearl, the edge where it touched up against the Yellow River to the north. She alighted atop an old warehouse perched alongside the docks, its warped wooden walls leaning out over the dark water like an old drunk teetering as he attempted to stand. The shingles beneath her threatened to creak, but she urged them to quiet and they obeyed. They held her weight, and for that she thanked them before turning her attention to the scene below. Two men stood upon the dock. Their attention was on the battered old barge that was even now rocking up against that portion of the worn wooden walkway, a heavy rope securing it to the rusted but sturdy stanchion embedded in the dock just past the tip of its nose. A strange hour to pull into port, Novia thought. Most sailing vessels would have waited until dawn before trying to settle into a slip here. Nexus was known for its treacherous channels which served as both a strong defense and an occasional deterrent. During the daytime, with an able pilot at the helm, such a task was easy enough. At night that same feat became extremely risky, yet clearly this barge had done so. Just as clearly, the duo she observed was tasked with greeting these eager visitors. The dockworkers were an odd pairing. At first glance, they did not appear dissimilar. Neither was overly tall or short, overly heavy or slight, overly dark or pale. They wore serviceable breeches and shirts beneath official robes that were tattered and worn, short enough to not interfere with walking but long enough to conceal and contain various tools and implements. They also wore plain dark caps, their surfaces marred only by the crest at the front, the emblem of the city itself, and both had on sturdy sandals, the same as many other locals wore, strong and able to provide good traction even on water-slicked boards such as the ones beneath their feet. Yet the two men could not have been more different. To Novia’s careful, well-trained eye, the man on the right was still and calm, his steps unhurried, his hands steady. The second man, on the other hand, was anything but calm. He was constantly shifting, shuffling his feet, tugging a coin from his belt pouch and flipping it from hand to hand. “Check the logs, did you check the logs?” the second man, whose name was Jiro Hatan, asked the first, who was called Miroku Bakar. “Yes, of course I checked the logs,” Miroku replied, just the barest edge in the words. But Novia saw the way he quickly turned away from his partner and scanned his clipboard to check said logs, and had to repress a snort of her own. So, although the calmer of the two and outwardly the more competent, Miroku was just as useless. Interesting. A woman emerged from the boat’s main cabin and sauntered across the worn deck before hopping over the rail and onto the dock with a casual grace. Novia sized up the newcomer with a practiced eye. Short, perhaps on par with Novia herself, but more solidly built, legs slightly bowed from years adjusting to the roll and pitch of a deck, hands heavily callused, tired smile, but eyes alert. Someone who could handle herself, clearly. Novia’s sharp gaze did not miss the flash of gold briefly visible beneath that paper as it changed hands, nor the way Miroku — the senior partner — tilted it so the coin slid into his waiting hand, which then dipped quickly into the pouch at his waist. There was no one else around to witness the transaction, which was just another part of doing business here. Bribes were par for the course in Nexus. They bought access to important people or moved your forms to the top of the pile. Fail to bribe the right people, and you might spend months waiting for a meeting with an administrator. Your paperwork might be shuffled among the wrong departments for weeks, or lost entirely, or your requests simply denied. Miroku was only doing what thousands of dock inspectors before him had done. But Novia still filed that information away. It could prove useful later. Miroku glanced over the documents, then passed them to Jiro, who studied them more closely, the parchment trembling in his hands. Also interesting, but not particularly unusual— Miroku had the seniority, so he took the bribes and did the official sign-off, but passed as much of the work as possible on to his nominal subordinate. Novia suspected this was why Jiro had hired her: He did all the work, but saw very little of the profits. Although that was typical in positions like his, Jiro wasn’t willing to wait for the day he got to be the one pocketing the bribes. Turnover at the docks was slow, and Jiro was impatient. Thus, he’d reached out to Novia — carefully, and with surprising subtlety — to help speed up the process. “Everything looks in order,” Jiro said finally. The barge captain hadn’t moved during the perusal of her papers, but Novia saw her stance shift ever so slightly now. She was relieved, and understandably so. Even for an honest boat captain with legitimate papers, there was always the risk of a shakedown or a screw-up. Either would cost money that had not been budgeted for the trip, and so ate into what were probably already meager profits at best. Jiro’s partner nodded and made a mark on his clipboard. He accepted the papers back from Jiro, signed them, and affixed the chop hanging from the clipboard’s top. The captain accepted the papers with a more open smile, saluted, and made her way back to her boat. Most likely she would sleep on deck — the night was pleasant enough, and it was both safer to stay close to whatever wares she’d ferried in and far less expensive than seeking even the basic accommodations the city had to offer. With the boat captain gone, Novia once again focused on the two men. They chatted about inconsequential matters as they strolled unhurriedly to the small, sturdy hut perched just past the point where all the docks converged. Novia followed, creeping across the warehouse until she reached its end, and jumping the distance to the next one. She knew once the men slipped into that hut and shut its door against the wind she would be unable to hear them any longer. Not unless she wanted to drop down to street level and approach the hut itself, but that would be taking an unnecessary risk. Besides, she had all she needed from them. After seeing them safely ensconced in their small workspace, she set her sights on a different building a short ways beyond. This was a larger, more imposing structure, still made of wood but with significantly thicker beams, heavier posts, and sturdier frames. It faced the docks and stood like a guard dog protecting the city beyond it from the riffraff off the river. The warehouses were arrayed behind it like nervous merchants huddling for protection. This was the Northern Dock Station, where most of that locale’s extensive inspection, recording, and taxation divisions worked throughout the day and often deep into the night. At this very moment at least half the windows were lit, as inspectors hurried to finish the day’s tasks before heading home to meager suppers and fitful slumbers. Novia was drawn toward an office at the corner of the topmost floor, but forced herself to ignore it for now. Best to handle these matters in the appropriate order, she knew, and so she quelled her own impatience. She jumped down into the alley between the two buildings and landed lightly, settling into the shadows. Then, trailing those same shadows behind her like obedient pups, Novia exited the alley and moved silently but purposefully toward the office building’s front. Anyone who might have seen her would have assumed she had some official reason for approaching that structure, based solely upon the confidence she exuded. But, even with the bright beacon of her jacket and her hair, no one noticed her. Listening at the door, Novia heard a soft susurration from within. Holding her breath, she tried the handle. It wasn’t latched. Easing it open a crack, she peered inside. Clutter littered the office, with jumbled piles of paperwork on every surface. Pages stuck out of ledgers, some stacked so haphazardly they were an avalanche of vellum in waiting, poised to crush an unsuspecting official at the slightest jostle. Yanitae Sou, the office’s occupant, was a heavy man, made more so by complete indolence and, no doubt, frequent drink. A nearly drained bottle on his desk confirmed that last detail, as did the empty glass beside it. He lay sprawled in his chair, head back, arms out, legs forward, eyes closed, mouth open. The noise had been his snores. Novia only regarded him a second or two before sliding the door shut again. Next she headed for the building’s narrow, rickety back stairs. One flight up she found her next destination, a door marked “Saria Lenko, Senior Dock Overseer.” There was a light on behind this door as well, but different sounds emerged through it — that of a quick scratching, with the occasional pause. Saria Lenko was not only still awake and still in her office but still working, writing reports or making notations with quill and ink. So here, at last, was someone competent. That was reassuring, though not for Novia’s specific purposes. Looking in on Saria would be impossible without garnering attention, and that Novia could ill afford. She turned away and headed for the the top floor and her final stop of the night — another office, this one larger and significantly more grand. Fumo was an important man, second only to the Rivermaster himself. He was in charge of all water trade in and out of Nexus along the Yellow River via the north dock. His counterpart oversaw all commerce along the south dock facing the Gray River, and together they kept the Rivermaster advised about what came and went to their fair city. Fumo Anasol was an older man and had held the post of Dockmaster for the past decade or more. He had worked the docks his entire life, which now comprised some six decades at least. Novia had spied him from a distance more than once, but this was the first time she had approached him directly. But, as with Saria below, she was only able to go so far. As there, Fumo’s office still showed light, and the sound of writing emerged when she pressed her ear against the door’s smooth, polished wood — not against the frosted glass set into it, for if he had looked up then, he might have seen her shadow. His writing was slower than Saria’s, with more fits and starts and the occasional muttered curse, followed by more frantic scratching. Mistakes, no doubt. He was an old man, after all. More knowledge to file away. For now, however, her night’s work was complete. This had been a fact-finding mission only, and Novia counted it a successful one as she stealthily made her way back down the stairs, through the halls, and out a small side door that let her out behind the building. She was smiling as she allowed the shadows to swallow her up as she turned her steps away from the docks. Tomorrow she could set some of her plans in motion. 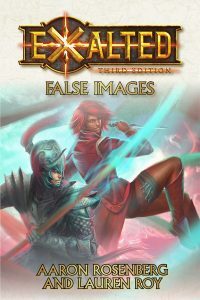 Exalted: False Images is available in ebook and print via DriveThruFiction, or via Amazon Kindle or B&N Nook.